Milan is Italy's second largest city and a world centre for banking and high fashion. Famous city landmarks include the Duomo (Milan Cathedral), the Galleria Vittorio Emanuele II shopping plaza and the La Scala Opera House. Many people visit Milan to shop for fashionable Italian shoes, dresses and suits. 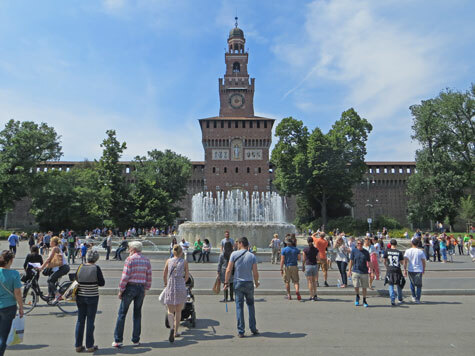 Top tourist attractions include the Sforza Castle, Piazza del Duomo and several top museums. Hotel accommodation can be found near the Milan Cathedral, at the convention centre and in Milan's popular shopping districts. Two international airports serve Milan: Malpensa Airport and Linate Airport. Europe's low-cost airlines provide inexpensive airfares to Milan. Milan is a major rail transportation hub. Trains depart from Milan's Central Train Station. The city also has an excellent metro and tram system.